Balikpapan weather shares the typically balmy and humid conditions that you would find throughout the Indonesian archipelago. Outside, temperatures range between 24-32.5 degrees Celsius throughout the year. It is a tropical monsoon with a wet season featuring intermittent downpours between October and May, and a dry season with sunnier days from June to September. 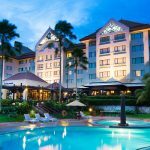 Bahasa Indonesia is the national language of Indonesia, however Le Grandeur Balikpapan welcomes international visitors from all over the world. We have Guest Relations Officers who are able to communicate in English at your service. The national currency is Indonesian Rupiah (IDR) and all monetary transactions within Le Grandeur Balikpapan will be made in IDR, as per Indonesian government regulations. We also accept credit card payments, so don’t forget your trusty VISA, MasterCard or American Express. Please be advised that credit card payments are made in Indonesian currency as per Indonesian banking regulations however the amount stated on your credit card bill will be in your home currency at the exchange rate of your credit card’s issuing bank. Medical needs for our guests are catered for by a clinic with a doctor on call 24 hours, and supported by a highly efficient emergency evacuation system. Duty free concessions for visitors entering Indonesia include a maximum of one litre of spirits, one litre of wine, one litre of beer, 200 cigarettes or 50 cigars or 100gm tobacco and a reasonable amount of perfume. Photographic equipment, typewriters, recorders and computers must be declared at customs upon entry. Television and radio sets, drugs, arms and ammunition, printed matter in Chinese characters, Chinese medicines, transreceivers (without advance approval), all uncensored movie films and video cassettes, fresh fruits, plants and animals without quarantine permits are prohibited.